Considering the SCP foundation already has a designated place for "joke" entries, we often run into the question of just how goofy a "main list" entry is allowed to get, and if you ask me, 2337 pushes the limit in the best way. 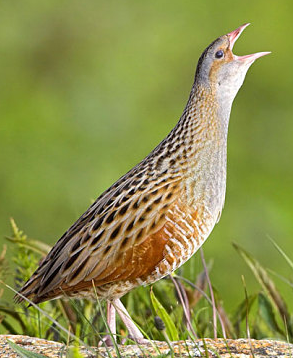 This SCP is a sapient, talking bird, specifically a corn crake (Crex crex) who seems to understand basic English but responds with his own bizarre dialect that often seems to us like nonsensical gibberish. He also speaks loudly enough to almost rupture people's eardrums at a minimum, answers to the name "Dr. Spanko," replaces words with "CACK!" for no known reason and really likes gummy worms, which he calls "stranglefruits." Maybe this sounds like the kind of Hot Topic T-shirt humor so "random" and meaningless that it loses any emotional impact, but there's something about Dr. Spanko that treads a perfect line between the meaningless and the merely cryptic. We may not have context to understand his dialog, but there's enough of a pattern to it that it doesn't feel too different from an everyday language barrier, or perhaps the difficulty we face reading the thoughts and intentions of regular, non-speaking animals. Spanko even offers a little dash of horror, in that other SCP entities are said to know his name and "express interest in meeting" with the screaming bird, as though the good doctor is some kind of famous authority figure among higher dimensional entities; something far greater than the screaming, candy-eating bird we humans are perceiving. What makes this sort of thing "work," for me, is that a dash of the ridiculous adds more realism and believability to a fictional setting. In a world where anything is possible, everything is not going to come out "cool," and it's honestly difficult for me to get into a setting that tries too hard to keep everything grounded in some level of seriousness. If a canon has nightmarish, world-ending baby-eating cosmic abominations in it, then it's every bit as likely to contain something like Doctor Spanko here.